He was working as the club's under-23s coach and suffered a cardiac arrest. His wife Gemma Ehiogu launched the appeal on JustGiving to help fund an equal opportunities charity, giving youngsters access to football. The page had an initial target of Â£1,000 but had broken that figure by more than 2,000 per cent on Wednesday morning. In memory of Ugo Ehiogu #DoSomethingKind. 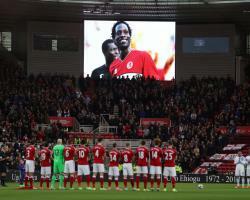 Thank you, In memory of Ugo Ehiogu #DoSomethingKind." The hashtag was trending in Great Britain and the United States after it emerged Ehiogu had used it on March 29 to describe donating Â£10 to a homeless girl. The appeal has received strong support, with donations from Middlesbrough, Arsenal, Rangers and former Villa team-mate Mark Bosnich. You will never be forgotten by Middlesbrough Football Club or the people of Teesside."